Ceramic Fiber Textile is alumina-silicate based refractory fiber, white and odorless. With a reinforcement carrier (usually high temperature fiberglass), the fiber is made into industrial textile products such as cloth, tape, twisted rope, square and round braid, yarn, etc. ceramic fiber textiles resists temperature as high as 2300º f. This material is lightweight and has very low thermal conductivity. Ceramic fiber textiles provides excellent insulation at high temperature. Ceramic fiber textiles also resists corrosive chemicals, commonly used acid and alkali. The fiber is strong and abrasive. Ceramic fiber textiles can be used in extreme environments. 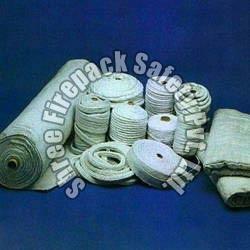 Ceramic fiber textiles is a good substitute for asbestos products in many insulation and sealing applications. product styles ceramic fiber yarn: 2-ply; 3-ply,6ply ceramic fiber cloth: standard size: (1m x 30m) with inconel wire insert 116”(1.5mm) thick; 2mm thick, 18”(3mm) thick,14"(6mm). with fiber glass insert (no wire) 116”(1.5mm) thick, 2mm thick, 18”(3mm) thick,14"(6mm). ceramic fiber tape: tape standard width: 1”, 2”, 3”, 4” standard length: 100’ (30 m) with fiber glass and inconel wire, 18”(3mm) thick; 14”(6mm) thick with fiber glass insert (no wire), 18”(3mm) thick; 14”(6mm) thick ceramic fiber square braid: square braided packing rope.